just right—follow these few tips and it will be as easy as saying bon appetit. 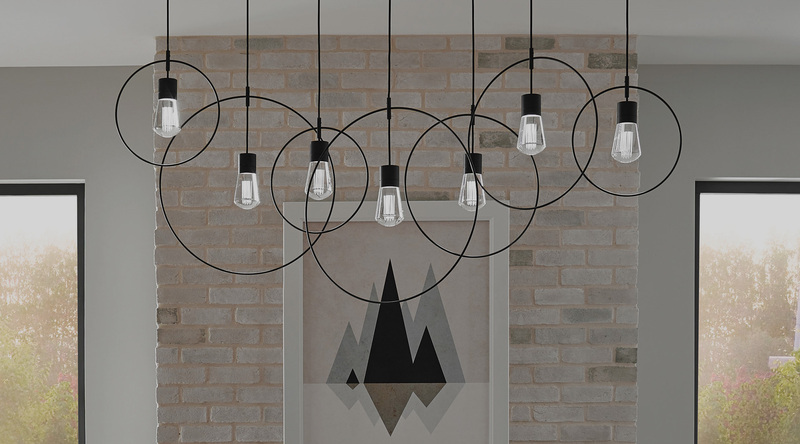 Picking out the right dining room light doesn't have to be complicated, but you do have a lot of options when it comes to pendant lighting, linear suspensions and chandeliers. Here are a few of our top dining room lighting tips for choosing the right light for your space. Pick a light fixture that relates to the dining room table, not the room itself—in terms of size, shape and style. Round fixtures like chandeliers are an easy win with round tables, whereas you can’t fail with a linear fixtures over a rectangular or extension table. A more flexible option is multiple pendants arranged to complement the shape of the table, either grouped together for circular tables or in a row for rectangular tables. The dining room light should be at least 12 inches smaller than the table in all directions. So, for a 4-foot wide table, look for a light that's no more than 2 feet wide. For proportion, linear suspension lights should be anywhere from 1/3 to 2/3 of the length of the table. Linear pendants and chandeliers are the ideal choice for long, rectangular dining tables or extension tables. All dining lights should hang about 30 inches above the surface of the table (no need for face-to-light contact with a tall uncle). You'll want keep in mind suspension length when choosing a fixture. If you like it then you shoulda put a dimmer on it. Install a dimmer switch with a dining room chandelier, and make sure the fixture itself is dimmable (note: installing a dimmer and a light fixture that is dimmable are two different, but important, things). A decorative chandelier in the dining room generally offers a low level of light output—they're really about setting the mood and drawing your eye to the center of a room. For a more functional style of lighting, use layers of light with recessed lights, wall sconces, etc. And if you need a bright amount of light in the dining room, look to an LED chandelier. When adding layers of light, think vertically—layers from the ceiling to floor—and horizontally—layers from one side of the room to the other. With the right combination of ceiling and wall lights, you'll create the perfect layered room. Determining the necessary wattage requires a bit of math—we like this tip from Kichler: Multiply the width by the length of the room (in feet). Then, multiply that number by 40. For example, if your room is 15’ x 20’ = 300. Then, 300 x 40 = 12,000 lumens. So, the collective lumen output from all light sources in the room should total roughly 12,000 lumens.